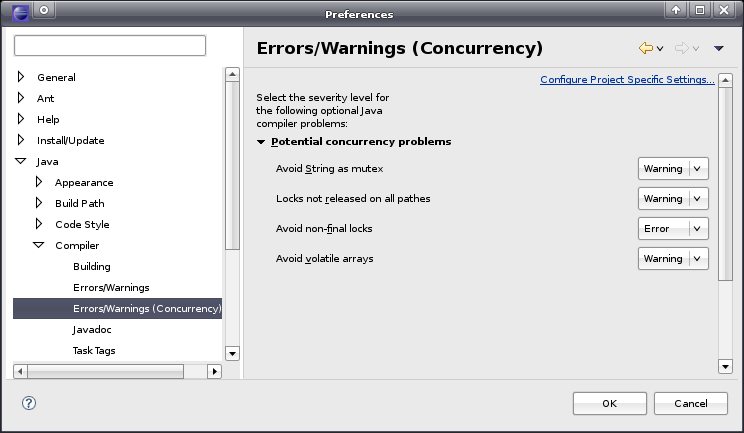 Difference between revisions of "Concurrency-related refactorings for JDT"
|| With the addition of the <code>java.util.concurrent</code> package in Java 1.5 you're now able to use other types of locks then the built-in <code>synchronized</code> statement. In order to quickly convert your synchronized statement to a ReentrantLock (which is essentially the same), we will now provide a quick fix for this. But please use the ReentrantLock only if you really need it's additional features which are not available with the <code>synchronized</code> statement. Prices of multi-core cpus are dropping and the move of multi-core processors to desktop machines doesn't stand still. There is a growing need of software developers to handle with concurrency-related problems in their application in order to improve the scalability. Today Moore's law is not applicable in the original sense as parallel computing increases. This idea growed up out of these reasons. Todays developers are all aware of the complexity of concurrent development but cannot handle this complexity very well. In many cases it's not possible to detect such problems with static or dynamic code analysis which implies that developers need to take care of it. The main idea of this project is not to solve concurrency problems but to help the developer to concentrate on the real hard things and eliminate the machine-solvable problems. The whole proposal can be found here (pdf). One idea to improve the usability of refactorings in due consideration of concurrency is to merge different synchronized blocks into one. In the case the devel- oper sees that two synchronize blocks (with the same lock) could be merged to one single block to avoid context switching. This fits into the category of quick assists invoked by the user on demand. I don't see a chance (at the moment) to detect such cases without the knowledge of the dynamic behavior of the source passage under stress. This is a typical case of what I meant in the introduction. The developer has to decide about the real problem and JDT should just help him to make the code clean as he want it to be. Splitting or striping locks helps to reduce the size of synchronized blocks. Splitting the lock at an specific position should not be the problem with this as long as the user provides informations where to split it. Maybe it's possible with some research to come up with some magic to have an automated partition of the lock depending on the static analysis (at least for trivial code ows). I don't see \the magic" as something which should definitely be implemented but could be continually improved. Everything is fine with the usage of the synchronized statement. But projects are more and more migrat- ing to J2SE 5 where new synchronization mechanisms are available. As those should only be used if there is a need for the advanced features of eg. Reentrant- Lock there is no anchor for a compiler warning or error. But we should consider to help the developer by providing quick assists to transform the code be- tween different synchronization styles. An example is the convert between a synchronized block/method and the usage of a ReentrantLock. This would help the developer to not care about stuff like releasing the lock in a finally block as this can be done by the quick assist. Maybe the definition is a bit too vague - that goal is not to find concurrency problems and introduce a new lock or something like that. The usecase here is rather simple. When we have cases where a lock is needed due to a compile error like passing null as lock to a synchronize statement, this refactoring has it's big coming out. It should be very similar to the \Introduce field" quick fix with some slight modifications like a better guessed name, private and final modifiers, initiating a new Object directly. These are just some ideas which apply to my coding style but need to be discussed again with a broader audience. Here we will list all the features which are currently available in the plugin. Compile warnings for non-final locks Many developers have the need that every lock should be final to not change the lock inside the synchronized block. The plugins adds a new compiler warning which checks every used lock of synchronized statements wether they are final. In order to quickly fix this warning, a new quickfix was introduced to react to this warning in order to turn the field into a final field. Compile warnings for volatile arrays Declaring an array field as volatile does not ensure visibility of its elements. Volatility cannot be manually propagated for arrays because array elements themselves cannot be declared as volatile. Quick fix for null mutex It happens from time to time that we insert null as mutex for a synchronized block which is not possible. JDT already marks this as error as you can see in the first screenshot. In order to quickly fix this error, a new quickfix was introduced to introduce a new lock. Preference page for problem severities As everyone has it's own style of development or is only interested in some of the compile checks, there is now a preference page which let's you decide if you want to see the problems as warnings or as errors. You can even disable the checks completely. Avoid global locks Locking on global objects like Strings (internal sharing of JVMs) or Boolean.TRUE / Boolean.FALSE can lead to deadlock situations between unrelated code blocks. We introduced several compile errors for these cases. See also this well-known bug of Jetty. Inlining synchronized methods JDT does a great job with providing the "Inline method" refactoring. There is just one major issue that synchronization is completely ignored. 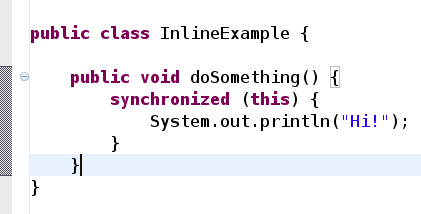 In order to fix this, I'm working on a patch for the "Inline method" refactoring which allows you to inline synchronized methods and still having the proper synchronization in place. This will be availabe in one of the next builds of JDT after the patch is accepted (see bug 112100). Having a class like the following and inlining the method doSomethingWithLocks now correctly synchronized the inlined statements. Warning for overriding synchronized methods without sychronization It can happen easily that one overrides a method which is synchronized without synchronizing itself. This is not needed in every case but often appears to be a fault source. In one of the next builds, JDT/Core has a new compile warning for these cases. See also the corresponding bug for more informations. 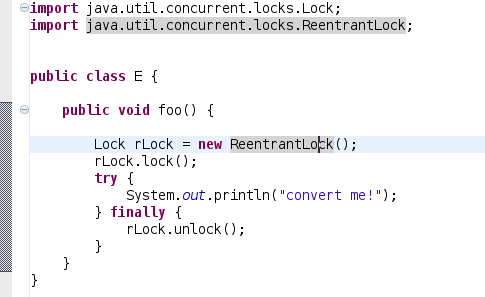 Convert between lock types With the addition of the java.util.concurrent package in Java 1.5 you're now able to use other types of locks then the built-in synchronized statement. In order to quickly convert your synchronized statement to a ReentrantLock (which is essentially the same), we will now provide a quick fix for this. But please use the ReentrantLock only if you really need it's additional features which are not available with the synchronized statement. In order to have community feedback this project will release a new update site for every release. It consists of a set of plugins which extend JDT with new features. There is no need to crazy patchin' you current installation - just add the update site to your P2 installer and install it. Here is a complete list of the milestones and release candidates planned for this plugin. To see all the open issues and feature requests of this project, take a look at this query. Do you have a great idea for a refactoring, quick fix or compiler warning regarding concurrency issues? Just open a new feature request against the SOC component and prefix it with [jdtc]. This page was last modified 19:47, 4 August 2008 by Benjamin Muskalla. Based on work by Moritz Post.